Eroica Trio pianist Erika Nickrenz puts it this way. "There is something about the 'melting pot' that is America that has inspired an explosion of original musical styles." 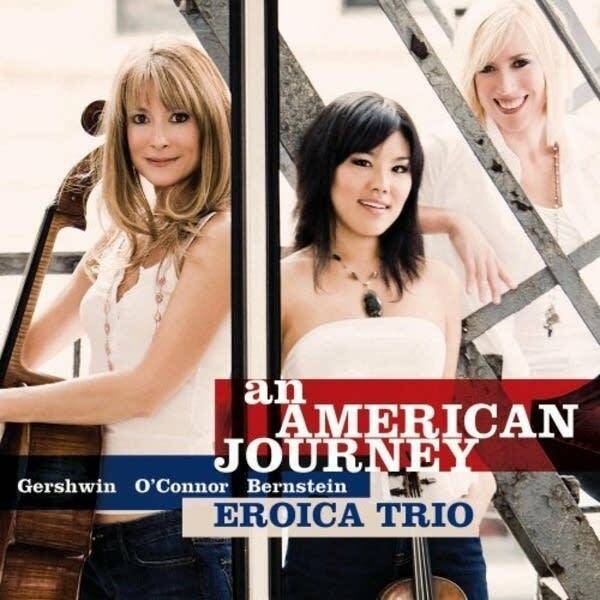 In a new release called "An American Journey," Nickrenz and the rest of her band, violinist Susie Park and cellist Sara Sant'Ambrogio, offer a sampler platter of unmistakably American fare. The three composers featured on this disc are George Gershwin, Leonard Bernstein and Mark O'Connor -- guys who have a reputation for melding genres and blurring boundaries between classical, jazz, Broadway, folk and country, and creating a new sound, distinctly their own. Mark O'Connor crafted a pretty remarkable tribute to American legend Johnny Cash with "Poets and Prophets," written for the Eroica a few years ago. "That one person [could] move mountains with his charisma and voice," O'Connor said of Cash. O'Connor says Cash sang about everything -- faith, prison, love, drugs, poverty. Violinist Susie Park says the characters in all the pieces on this album face the same struggles, and "choose to face their separate challenges with chin up and positive flair." Whether our parents grew up here or in Africa, Ireland, Eastern Europe, Mexico or wherever, we all have things in common. We all fall in love, for one. Often with people our families don't approve of. Leonard Bernstein's reimagining of Romeo and Juliet was set in the gritty streets of New York. The feuding families of the Montagues and the Capulets are now the rival gangs, the Sharks and the Jets. Bernstein's "West Side Story" is a microcosm of everything that's great and awful about the melting pot -- the vibrancy of imported customs and cultures and colors; the generations of mistrust and suspicion; the violence that springs from fear; the power of love to bridge these gaps. What makes Americans so unique is that, at some point, almost all of us came from someplace else. We become part of the American stew, but we bring the distinct flavor of our origins to the mix. And when we make music, Erika Nickrenz says "It's hard to define what these styles are, because they are all so different. Yet, when people hear this music, they know it is American."